Once you have viewed the assignment results for your class or an individual student, you must determine the specific cause of any problems. There are several actions you can take. Observe the student and give immediate feedback. Meet separately with the student, give feedback and suggest actions. Modify the assignment such as skipping, assigning or reassigning skills. Reassign unit components (e.g., mini-lesson, activities, quiz). Create or select a new assignment that includes different skills or is on a different level. Note: To generate an Instruction report, view information on the different options on the Help Center under Reports. The data provided by the Classworks reports will help you determine why the student is struggling with an assignment. Below are possible problems and actions to take. If the student is not spending an adequate amount of time in the mini-lesson. Discuss with the student the purpose of the mini-lesson. Discuss what the student should be looking for in the mini-lesson (e.g., key vocabulary, sample problems, etc). Require the student to take notes from the mini-lesson (older students). Let the student know that you will be continuing to monitor this. If the student performs well on the quiz, but not well on the activities (practice portion). Typically this means that the student knows the content because he/she can pass the quiz. Conference with the student. Ask the student if s/he did not understand how to complete the activity or did not understand the concept. Note if the student spent an adequate amount of time in the activity? If not, conference with the student to explain the importance of putting forth their best effort. Review the activity instructions with the student. Possibly launch the activity from the Teacher Module and go over the first couple of questions together. Reassign the activity once the student is on track. Determine if the activity is appropriate for the student's learning level. Possibly skip the activity or consider completing the activity with the whole class or in a small group setting. Student performs well on the activities (practice portion), but not well on the quiz/post test. Typically this means that the student knows the content (because they can pass the activities), but may not be putting forth their best effort on the quiz. Look at the time on task spent in the quiz; is it not adequate? Conference with the student. Explain that the quiz/post-test is an important component of the unit structure and that this is how Classworks (and you) determine if the student has mastered the concept. If the student has failed the majority (or all) of the unit components. First look at the time on task – is the student putting forth their best effort? If not, conference with the student and reassign the unit/unit components. Continue to monitor closely and conference with the student again on his or her improvements. Is the content above the student's instructional level? Does the student have the foundational skills to complete the activities? If not, possibly create a custom assignment (a grade or two below) that reviews the concepts needed to successfully complete the unit. Once the student masters the custom assignment, reassign the failed unit again to see if they can now master it. Is the unit covering concepts that have not been taught yet? If so, skip the unit until the concept has been taught. Is the mastery set too high? Consider adjusting. If the student continues to struggle, conduct some one-on-one tutoring with the student to determine where they are going wrong. If the student is mastering all unit components with a 90% or higher average. Is the student working below his or her instructional level? If so, possibly create an on or above grade level assignment that covers similar skills to help challenge the student. Or assign the student a Classworks project which gives the student an opportunity to show real world application and critical thinking related to the skills learned to demonstrate mastery. Is the assignment focusing on skills that the student needs? If not, possibly assign a Skills Snapshot or custom assessment to help identify that particular student's weaknesses to then create a more focused individualized learning path (ILP). Research shows that when timely feedback is given for student work, learning improvement is measurable. Classworks provides students immediate feedback throughout the lessons. Teachers, after viewing assignment results, can give the students appropriate feedback. You can modify an assignment for either your entire class or individual students by skipping an assignment, assigning other units or components of units, or making assignments inactive. 1) From the Classes tab, click on the class name. Note: Once the Class Assignments page displays, you can change to another class by using the Class drop down box at the top of your screen. 2) Click Customize next to the name of the assignment. Note: Current assignments are displayed. 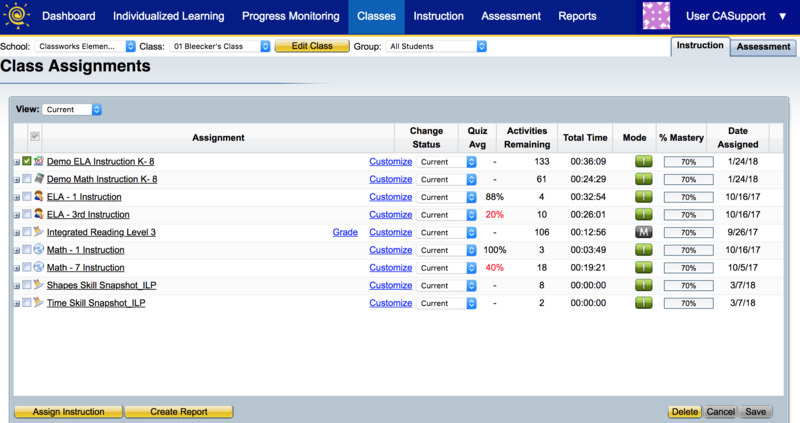 If you want to see Inactive or Completed assignments, use the View drop down box in the upper left of the screen. 3) To find and select a unit's component, click the + to expand the list. To assign the unit or unit component, change to a √ symbol next to its name. To skip the unit or unit component, change to a Ø symbol next to its name. 2) To see the list of students that have been assigned a particular assignment, click the + sign to the left of the assignment. 3) Click Customize next to the name of the student. 4) To find and select a unit's component, click the + to expand the list. To assign or reassign the unit or unit component, click the Assigned radio button. To skip the unit or unit component, click the Skipped radio button. You can deactivate an assignment for an entire class. You would do this if you do not want the students to be able to access the assignment from the student module. 1) From the Classes Tab, click on the class name. Navigate to the Instruction Sub Tab. 2) To deactivate an assignment, change the drop-down box next to Customize from Current to Inactive. Note: You can re-activate an assignment by changing the status drop-down box from Inactive back to Current, then click Save. If you need to delete an assignment, possibly due to an error, it can easily be done. However, if you delete an assignment that students have spent time on, the data will be removed. You will not be able to retrieve the data. 1) From the Classes tab, click on the class name. Then click on the Instruction sub-tab. 2) Locate the assignment you want to delete. Put a check in the box beside its name and click the Delete button. Note: The assignment will disappear from the screen; however it is not deleted until you click Save.